Thus far volatility has played its part with the oil patch being the poster child for it. The current question on the direction of oil seems to me like watching a duck on a pond, many people seem to only be watching the direction the duck is going rather than looking at the duck’s legs underwater to see which way the duck is going to turn next. It may surprise you to learn that oil production has been steadily declining since April in the US based on EIA drilling productivity reports. Do not be fooled by reports that OPEC production is going to flood the market all of a sudden. This is a whole other essay unto itself but suffice it to say that many member have been in decline for years and those that currently aren’t (e.g. Saudi Arabia) have been re-working old fields with new technology since 2010 with no new discoveries. Prior to 2010 Saudi production was declining around 8% annually and since 2010 re-working old fields has helped but current levels are almost flat with where they were in 2011 – one year after the re-work program began. First, too many reports on oil are not taking into consideration the magnitude of technological advances that have resulted in significantly efficiency of new wells even just over the past two years. According to the EIA’s August 2015 Drilling Productivity Report, the average barrels per day has increased from 400 barrels to 692 barrels per well since the beginning of 2014. This data is often misinterpreted which gives rise to the second biggest mistake I see oil prognosticators make… rig counting. We hear lots of talk about rig counts in the media and their relation to future oil prices with little clarity of the actual relationship. I have found that quoting average rig counts in today’s new world of oil production is a futile practice. The data point within average rig counts that interests me, in relation to the future price of oil, is “spuds” – which is one sub-sect of total rig counts. Spuds tells me the number of rigs that are breaking new holes. Once a drill bit breaks ground an oil well is considered “spudded”. 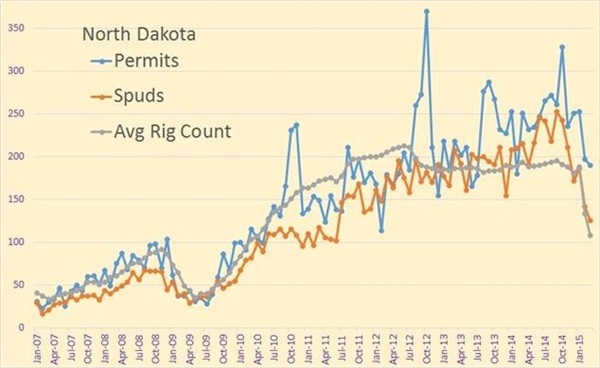 Right in line with this thought North Dakota’s Oil and Gas Division shows the total average rig counts was basically unchanged since January 2014 (last 17 months) yet “spuds” has decreased considerably since its peak in September 2014 at 253 rigs (spuds only) to 125 in March of 2015. Ron Patterson of peakoilbarrel.com puts out incredible detail and updates for the oil patch. See below his chart from his http://peakoilbarrel.com April 30th report ‘What is the data telling us’ illustrating this. Interestingly, the industry average from the time a well is spudded to when it begins production is about 120 days. It is no surprise to me then that production has been falling since January which is roughly 4 months after drilling for new wells began decreasing; in turn oil prices have been increasing along since January. 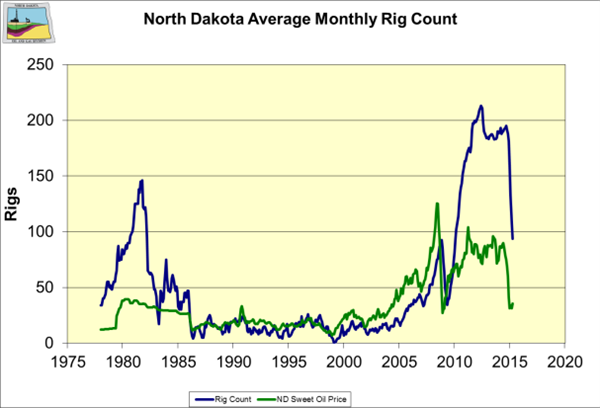 According to an UPI update 5/18/2015 “North Dakota exploration and production activity remains at a five-year low, but has held more or less steady for the better part of a month, state data shows 83 total rigs in active service as of 5/18/2014.” See chart below from the North Dakota Dept. of Mineral Resources(http://www.oilgas.nd.gov). Demand is the other side of the oil coin. This week, the Wall Street Journal reported ‘Oil Demand Growing at Fastest Pace in Five Years, Says IEA. Understanding demand can be difficult when estimates change rapidly and worse, reports of estimates contradict. Consider a couple of articles: March 13th story ‘IEA raises 2015 global oil demand estimate by 75,000 b/d to 93.5 mil b/d’ “The International Energy Agency(IEA) raised Friday, March 13, its estimates for world oil demand growth in 2015 following “tentative” signs of a demand recovery in the world’s biggest economy. Stronger-than-expected oil demand growth at the end of last year in the US on the back of rising economic activity saw year-on-year global demand growth reach 870,000 b/d in the fourth quarter, the IEA said, some 200,000 b/d higher than previously estimated.” Now compare that to this Reuters story from October 2014 titled ‘Oil Demand Outlook Lowered as Sub-$60 Price Seen Holding’ which said “The IEA said it cut its 2015 estimate for oil demand growth by 300,000 barrels per day (bpd) from its previous forecast and now expects demand growth of 1.1 million bpd to 93.5 million.” Both have the same forecasted number 93.5 mil b/d yet one says IEA raised its estimate by 75,000 to get to this amount while another says IEA cut its estimate by 300,000 to get to this amount. This can certainly create confusion let alone contradicting analysis … ‘confusing the trees from the forest.’ Perspective is vital here. Looking at year over year IEA actual consumption we see that global consumption has risen year over year since 2009 and the latest IEA estimate for 2015 full-year forecast was just increased by 200,000 barrels/day (3 months ago it was increased by 90,000 b/d). This amounts to global consumption increasing by 1.3million barrels/day in 2015 up from 1.3 million b/d in 2014. Estimates for 2016 are now calling for global consumption to increase by 1.5million b/d. In summary, the key to today’s global oil supply is US production. And while the duck (production) appears gliding one way on top of the water, the duck’s legs (decreasing new wells and a rising back log of uncompleted wells) indicate something different under the surface, especially if global demand stays constant let alone increases as the IEA expects. We are truly living history, so each day brings with it new dangers and new opportunities. My team and I will continue to update you and work with you to sort our way through the turbulent markets. I invite you to call us at your convenience.